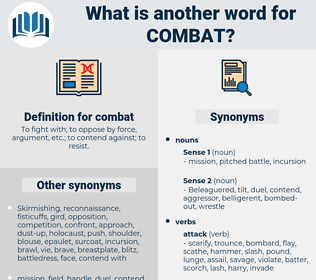 What is another word for combat? To fight with; to oppose by force, argument, etc. ; to contend against; to resist. clashes, cons, Efforts, Boots, Strikes, rejects, games, processes, Nays, women, confront, tackling, control, controls, Battling, tackle. contest, tackling, warfighting, control, battleground, bout, gunship. contend, confront, stamp, stem, discourage, control, crack, wrestle, thwart, counterbalance, contain, mitigate, respond, repress, curtail, dampen, treat. countering, alleviate, tackling, combatant, tackle. peace, accord, calm, truce, surrender, compromise, harmony, retreat, agreement. shelter, uphold, cover, protect, sustain, aid, shield, resist, withstand, befriend, concord, defend. support, give up, give in, agree, run, make peace, yield. Many were killed in single combat by a hero called One. De Mouy, after a terrible combat in the staircase and hall, had finally come out of the burning house like a true hero.